September 23rd at St Mary’s Church, Bocking. This is a community event and of course a celebration of cake to which all are welcome. So whether you plan to enter or not, come and join us for some Bake Off fun! This is our third year at running the event and we hope it will be the biggest yet, but we want YOU to take part. While Bocking is hosting the Bake Off we invite participants and visitors from all round, so if you fancy entering, don’t delay. In the main competition we have three categories. 6 Cupcakes, 6 biscuits and of course the Showstopper which must be based on a Victoria Sponge. For all categories taste, texture, and how adventurous you have been with the theme will be judged. 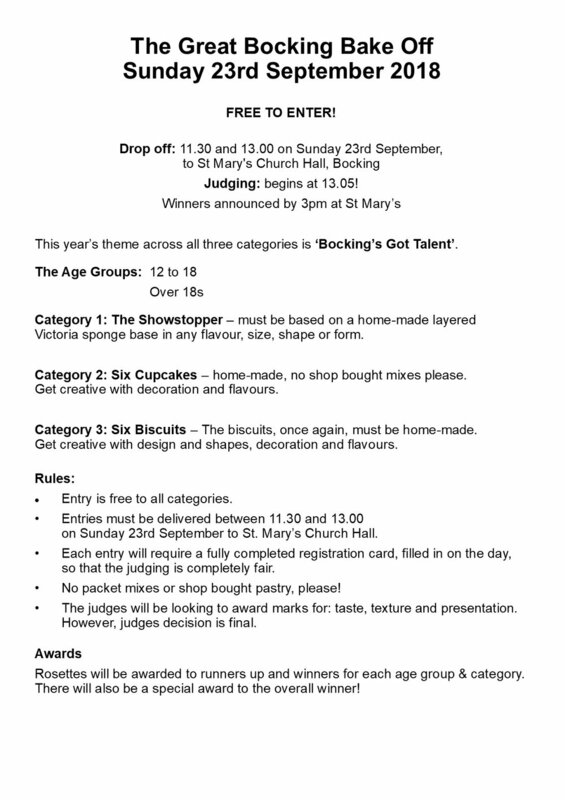 The theme is ‘Bocking’s Got Talent’. So, with your decoration show the judges a skill, hobby, achievement or passion. To accompany the Bake Off this year we have a Junior event. For our 11 and unders, their theme will be ‘The Circus’. Inspired by the Big Top or The Greatest Showman we invite entries for two categories. 6 cupcakes for our slightly older ones and 3 biscuits for our younger ones. It is free to enter but all cakes must be in for judging by 1pm at St Mary’s Church Hall. We aim to announce the winners at 3pm. During this time, there will be refreshments and cake. Plenty of entertainment and music, including your chance to have a go at bellringing. Add to that a tombola and your opportunity to buy some Bocking Bake Off merchandise. All profits will be going to the Essex and Herts Air Ambulance. For full details on the categories and rules see images below. If you click on the image it will change over from one to another.